Fall feels like the perfect time to glide. Maybe we are stepping out into a brilliant crisp day wearing cognac suede boots, or riding bikes along leaf littered paths, a satisfying crunch reverberating beneath tires that flatten acorns, foliage, and send butterflies fluttering in their wake. The day opens wide before us, an endless promise with baskets of sunshine to collect before the retreat to winter. Just now, if you bike past the cotton fields near Shirley Plantation and Upper Shirley Vineyards all will appear as snow on the distant horizon or clouds on the ground. October is a month of profound change in Virginia. We see it on trees, giving off the last of their fruits as leaves start to turn, on doorsteps giving shelter to pumpkins and gourds, and shoulders layering the fresh sweater or favorite scarf. We feel it in the air as cool mornings give way to the rich warmth of a sunny afternoon. October has also given me the opportunity to think about discovery and exploration, and to share the story of Virginia's land and the James River on our Signature Tour, A Journey Along the James. Biking 14 miles along the Virginia Capital Trail, ending with lunch and a wine tasting at Upper Shirley Vineyards, riders hear stories of our collective history and learn how science is making a difference at VCU Rice Rivers Center, where we make a stop, listening for the sounds of nature, and learning how environmental science is being practiced right along the banks of the James River. In another brush with that exploration the Liaison Committee of The Science Museum of Virginia invited me to speak to their group about Basket & Bike; as a creator, an entrepreneur, and a business owner. As I thought about the best way to deliver my message I turned to my journal, and to that spark that so often finds place on my pages, for inspiration. Here follows some of what I shared with the committee. I am looking forward to taking 15 of these women on their own bicycle excursion along the Virginia Capital Trail followed by lunch at Upper Shirley Winery Restaurant in November, and giving $225 to science, the James River Association and The Science Museum of Virginia. Science, to me, is how we understand our world - all that’s in it, how all the pieces fit together, our place in the wider cosmos. It’s about asking questions, searching for answers and then sharing with each other what we’ve learned. It’s a journey, really, because we’ll always have more questions to answer, more knowledge to share. We’ll always have more to learn. That, in a nutshell, is how I came up with the idea for Basket & Bike. My bike opened new worlds to me - new places to discover, so much to learn. And, as I pedaled my way across each little journey, there was so much I wanted to share. I believed others would want to come along for the ride. And, since it’s all about discovery, the basket seemed somehow important to me. It’s a symbol of the things we take with us - a snack, some cold water, a journal and pen, a scarf - as well as the things we might bring home. A pine cone from a roadside picnic stop at the edge of the forest on a summer’s day. A clutch of colorful leaves in autumn. A book about life on a Virginia plantation four centuries ago on the James. A scallop shell, the Chesapeactan Jeffersonious - our state fossil (did you know we had one? ), the size of a dinner plate, found by the shore. 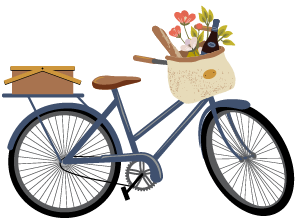 Basket & Bike is a chance for recreation, exercise and good times with friends. It’s also something more. It’s a new way of looking at the beauty around us. A new way of looking at the history that shaped our Commonwealth, and our nation. A new way of looking at ourselves. Rolling along quietly at twelve miles per hour, you see things you might miss from the car. The laughter of children playing in the schoolyard. A bevy of wild turkeys picking at a freshly cut field of corn. A great blue heron arcing across the sky with the grace of eternity beneath her wings. Our minds are made to ask questions, and to probe for understanding and thought. Our hearts, though, long to touch places that speak to us as people. To gain the insights of the soul. To feel the rain on our parka, the wind in our hair and the sunshine across our face. We want to be out there, don’t we? We want to glide deeper into beauty and awe. That, to me, is what Basket & Bike is all about. It’s about reaching a little deeper into the landscape, becoming a bit closer to this place we call home, traveling that great journey of discovery that has the power to enrich our lives, riding through our shared history, savoring the now and connecting us through a courage to build the future together. Tonight, as pumpkins glow and the earth stirs up her haunted howls, our temperatures will dip into the 40s, and our inner clocks will turn the page to a deeper fall. The November sun will rise upon our saints, across the river, and along our paths. It really is the perfect time to reach for that fresh sweater or favorite scarf, hop on our bicycles, and head out for that last adventure or two, before days shorten our stride. Fall feels like the perfect time to glide.